What is a 12 Week Property Disregard? If you move permanently into a care home and have less than £23,350 in savings then the Local Authority will make a financial assessment of your ability to pay. If you own a property the value of the property has to be disregarded for the first 12 weeks of care. This allows you to take a while whilst in care to see whether it is in fact for you before having to decide whether to commit and possibly selling your home to pay for our care. The transition into care can sometimes be gradual starting with what is planned as a temporary stay. So if your stay at the care home was indeed planned as temporary, then the 12 weeks under the disregard rule runs from the date on which it was settled that the stay in the care home is to be permanent. Who Is Eligible For The 12 Week Property Disregard? The 12 week disregard scheme is accessible by anyone who falls short of having enough savings, income or assets (excluding their home) to meet the full cost of their care. So if the value of your assets is reasonably deemed to be higher than what is known as the ‘savings threshold’ (as above in England and Northern Ireland in relation to the 12 week property disregard, this is £23,250 and £25,250 in Scotland and £23,750 in Wales) you will not be entitled to the benefit of the 12 week property disregard scheme. It is important to remember that you are only entitled to the benefit of the 12 week property disregard scheme for a total of 12 weeks in any given 52 week period. By way of example then, if you go into a care home for 7 weeks, then leave but return within a year, then you can only benefit from the 12 week property disregard scheme for a further 5 weeks. What If Someone Else Lives In My Home When I Go Into Care? What Happens To The 12 Week Property Disregard If My Property Sells Before The End Of The 12 Weeks? It is important to remember that the 12 week property disregard applies only to ‘real property’ i.e. a house. If the property sells within the 12 weeks then obviously the house’s worth is realised into money – or savings – and the chances are that you will then be over the savings threshold. In these circumstances the 12 week property disregard scheme will not apply and you will have to meet the cost of your care straight away. The Local Authority will cancel arrangements between you and them and you will be required to deal directly with the care provider to make appropriate arrangements. What Happens On Conclusion Of The 12 Week Disregard Period? Following the period covered by the 12 week disregard, the value of your property will be included in the financial assessment and count towards whether you are over the threshold. It is highly likely that as a result you will indeed be deemed to be over the limit in terms of qualifying for assistance and you will be assessed as having to meet the full cost of your care. It is, though, possible that the increase may be deemed as a deferred payment – this mean the Local Authority will meet the cost of any shortfall until such time as the property is sold at which point the balance has to be repaid in full. 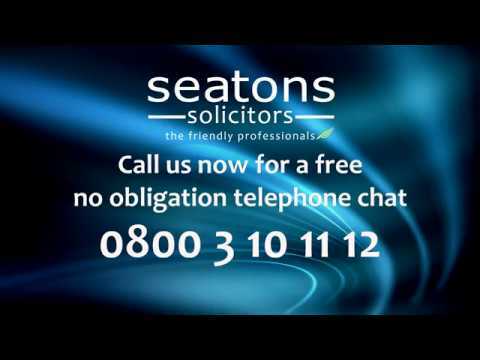 It is imperative that you seek independent legal advice prior to finalising any plans to fund care – Seatons can help you with this. Don’t forget – if you have a primary health need – all care has to be free of charge. Seatons is uniquely placed with medics on staff to assist in assessing the evidence of such needs. Can I ‘Top Up’ The Fees Paid By The Local Authority During The 12 Week Property Disregard Period? In short – yes you can. If the cost of the care home provision is more expensive than the Local Authority’s standard rate of funding, the difference needs to be met within the 12 week property disregard period. This can be met from any of the assets that are disregarded in the financial assessment or by payments from a third party – usually a family member. It is important to ensure that the level of fees in respect of the care is sustainable. If you are unable to maintain payments in respect of a top up, then it is likely that you will have to leave the care home you have chosen for a more affordable placement. No One Told Me About The 12 Week Property Disregard! Not being told by the Local Authority about the 12 week property disregard in circumstances where the Local Authority was on notice that you own your own home, then this should be the subject of a strong complaint to them. There is nothing ‘optional’ about whether the scheme applies – it is mandatory. The Local Authority should reimburse you for any losses that arise out of their failure to inform you of your entitlement to the 12 week property disregard. If you find yourself in this position and are struggling with the Local Authority – again Seatons can help. The 12 week disregard is only one aspect of care fee funding. By having both lawyers and medics on staff we are uniquely placed to help you with the care fee funding process.